A small contingent of loyal football fans sat with umbrellas and ponchos at Rancho High School as the unrelenting rain came down in torrents, soaking the two football teams on the field. Peter Davis/Special to the Pahrump Valley Times The Trojans senior Defensive lineman Jeremy Albertson catches a Rancho running back deep behind the line of scrimmage. 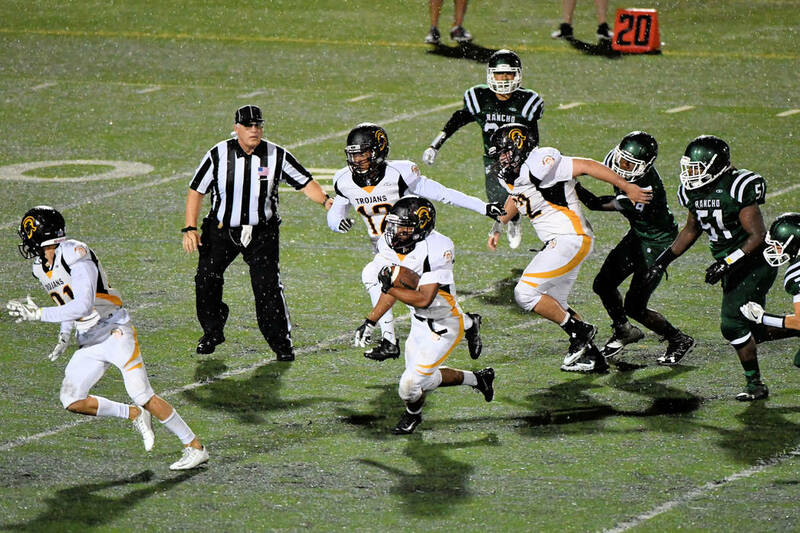 The Trojans defense did this all night. Peter Davis/Special to the Pahrump Valley Times Senior Trojans quarterback Dylan Coffman is in the end zone in the first quarter. 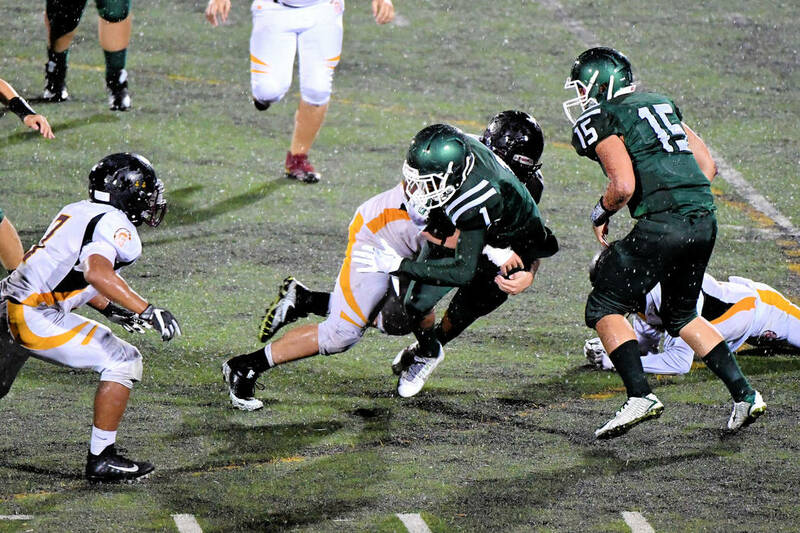 Coffman scored two rushing touchdowns during the rain-soaked night. The game was called late in the second quarter due to lightning strikes close by. Senior quarterback Dylan Coffman found holes all night long in the Rancho defensive line. Here he is seen running toward a hole in the Rams line. His longest run of the night was 22 yards. Peter Davis/Special to the Pahrump Valley Times Senior defensive lineman Jeremy Albertson sacks the Rams’ QB way behind the line of scrimmage on Friday night. 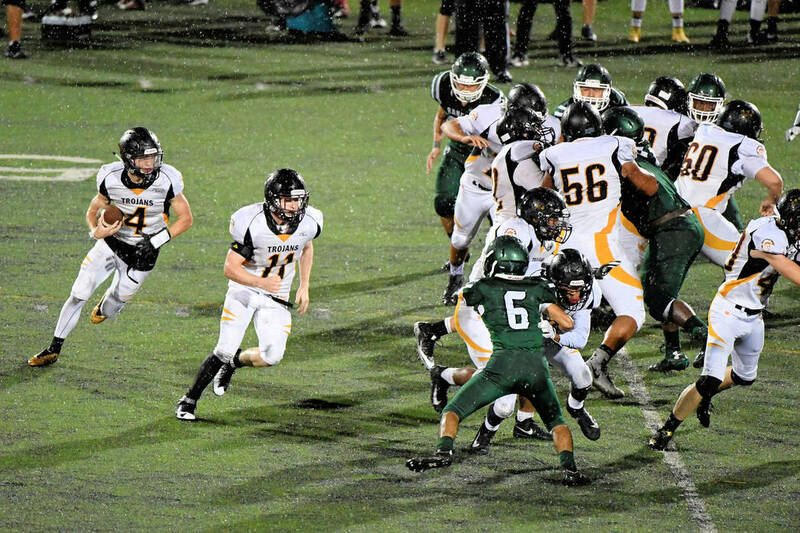 Albertson was caving in the left side of the line all night. Peter Davis/Special to the Pahrump Valley Times Junior running back DeAngelo Brown takes the ball downfield for a 31-yard gain. Brown had close to 74 yards in two quarters. On Friday, Pahrump Valley High School was one of the few teams to actually start its game, defeating Rancho 24-0 on the rushing by junior running back DeAngelo Brown, who had close to 74 yards and one touchdown. “I have never seen this much rain come down for such a long period of time in Las Vegas,” said one soaking wet fan. In the end, the game was called late in the second quarter due to lightning strikes that came close to the stadium, not the rain. The Trojans were not the only team to suffer from the downpour, nine other games were affected by the monsoonal rains (see box). One lightning bolt struck the lightning rod on the top of the Stratosphere Hotel and Casino, which was 3.9 miles away. As soon as that happened, the game was canceled. 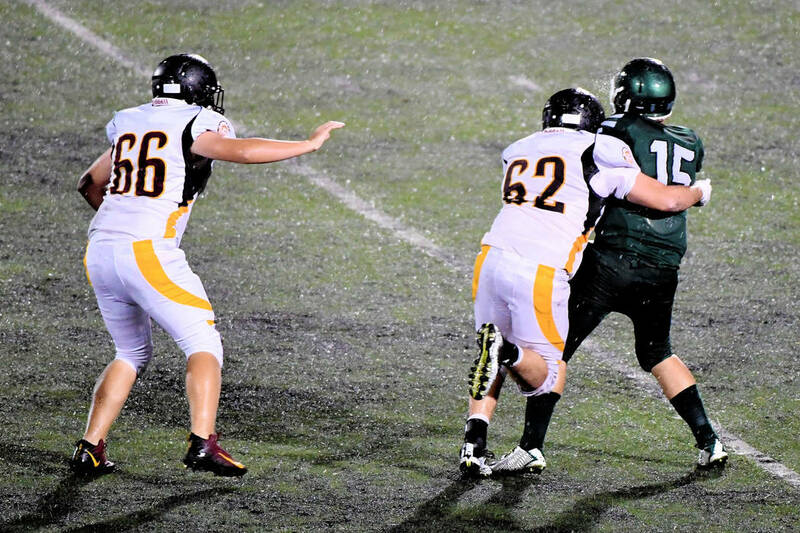 It took a while for both teams to get used to playing on the slippery turf in the deluge that lasted the entire game. The Trojans (1-2 overall, Class 3A Sunset League) had some misfires and miscues as their offense sputtered in the first series. Senior Trojans defensive back Jacob Sawin said there was some confusion on the field. After the rough start, the Trojans offense went to work and they were able to run the ball the entire game. Clayton said that his coaching staff also did their homework. The head coach of the Rams, Gary Maki, coached Del Sol last year. Mid first quarter the Trojans started on their own 26-yard line after a punt by the Rams (0-2, Class 4A Northeast League). Junior running back DeAngelo Brown on first down took the ball downfield for a 19-yard carry to midfield which gave the Trojans first and 10 on the 50. Two Rams penalties and two runs later and the ball was on the 32-yard line. On second and three, Brown got the call again and took the ball 31 yards to the one-yard line. Senior Trojans quarterback Dylan Coffman then scored on a quarterback keeper to give the Trojans the first score. The Trojans went for two and got the conversion on a Coffman keeper and the score was 8-0. That was a seven-play drive for 74 yards that took 1:59 off the clock. The Trojans defense went to work and Pahrump then held Rancho to a three-and-out which ended the first quarter. According to Clayton, the Trojans had several sacks in the game. Sawin said the practices helped the defense. 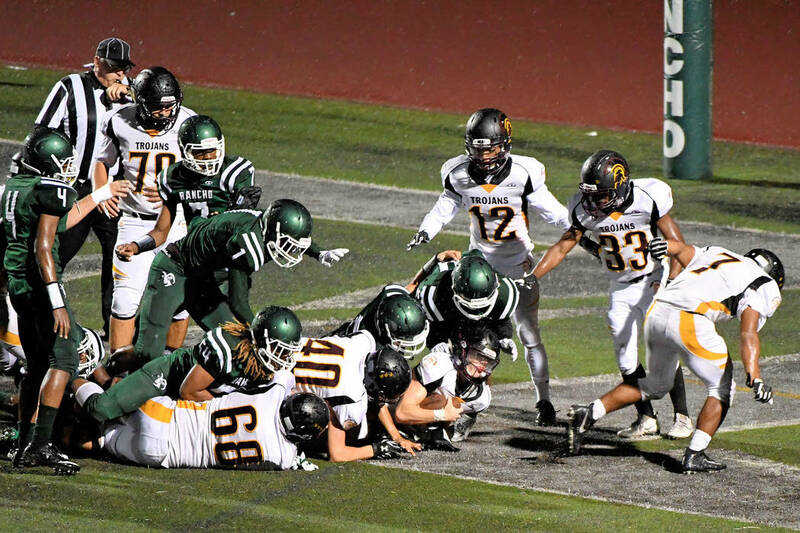 The Trojans got the ball on their 43-yard line after the Rancho punt, which gave them excellent field position. On the third play of the drive, Coffman then showed his speed as he kept the ball for a 22-yard run to the 32 of the Rams. There was a personal foul on the play, which gave the Trojans first and 10 on the 17-yard line. Two plays later, Brown carried the ball over the left side for a seven-yard TD run. The Trojans scored another two-point conversion on a Coffman run to make the score 16-0. The drive was five plays for 54 yards. Pahrump held the Rams again and after a short punt started on their 40-yard line. Brown got the call again and carried the ball for a 15-yard gain to the Rancho 45-yard line. Then on second down and four, the Trojans mixed it up a bit and gave the ball to senior running back Reese Sanholtz, who ran the ball for a 19-yard gain down the sideline to set up the third and final TD for the Trojans. The Rams got called for a late hit on the play and this tacked on 15 more yards, which gave Pahrump first and goal on the 10-yard line. On third and goal, Coffman went around the right tackle and strolled into the end zone. He then made another two-point conversion to give the Trojans a 24-0 lead. Rancho then marched down the field on several personal foul calls on the Trojans and with 2:56 left in the half they had the ball first and 10 on the Trojans’ 18. And that is when the game was called due to the storm.